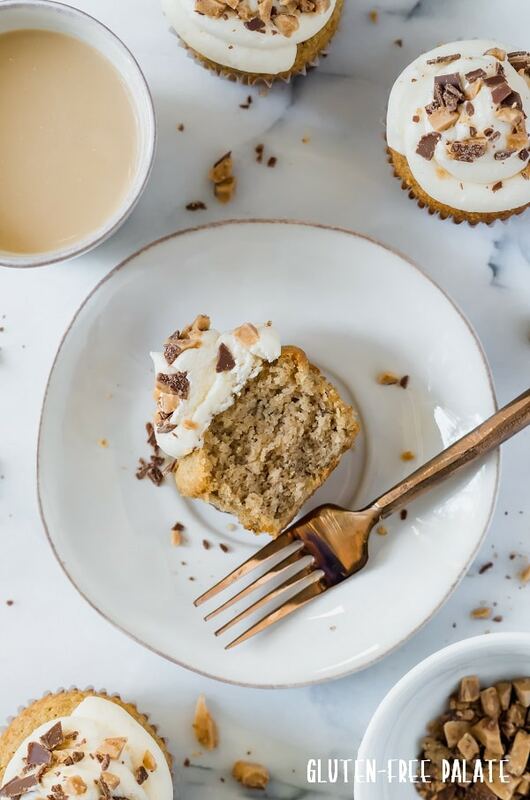 Sweet, tender, and bursting with bananas, these grain-free banana toffee cupcakes have the perfect combination of flavors. They are the perfect grain-free cupcake! This post is sponsored by Bob’s Red Mill. I was compensated for this post. Opinions are my own. If you have a leftover banana that’s been sitting on your counter, and it’s super rip, you NEED to make these grain-free cupcakes. If not then you need to buy a banana and let it sit out until it’s brown and mushy and then make grain-free banana cupcakes. The combination of flavors in these grain-free cupcakes is sophisticated and quite amazing. 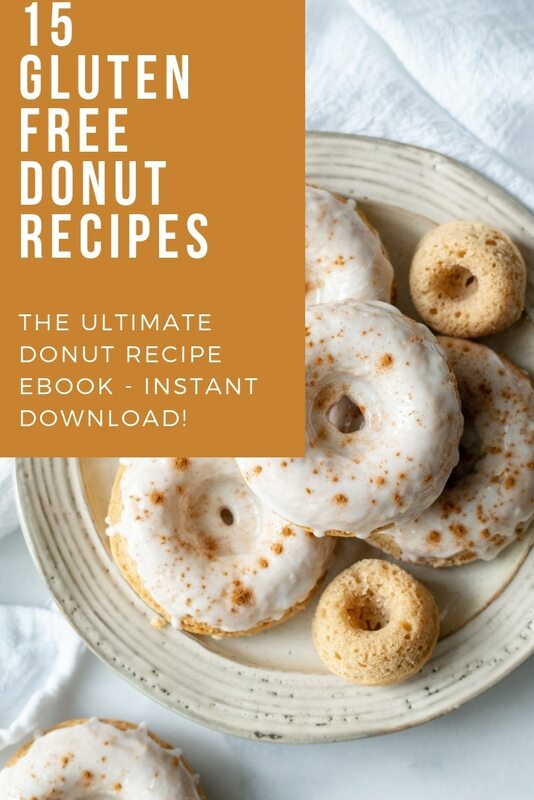 You can enjoy them plain or top them with your favorite gluten-free frosting. We’ve been making recipes using almond flour for a few years now. One of my favorite recipes is my Paleo Chocolate Chip Muffins. This grain-free cupcake recipe is derived from it, and might be considered an upgrade to any grain-free banana cupcake recipe. The combination of maple, cinnamon, banana, and vanilla create a toffee like flavor in these grain-free cupcakes. Yes, I did sprinkle some toffee on top of these almond flour cupcakes. 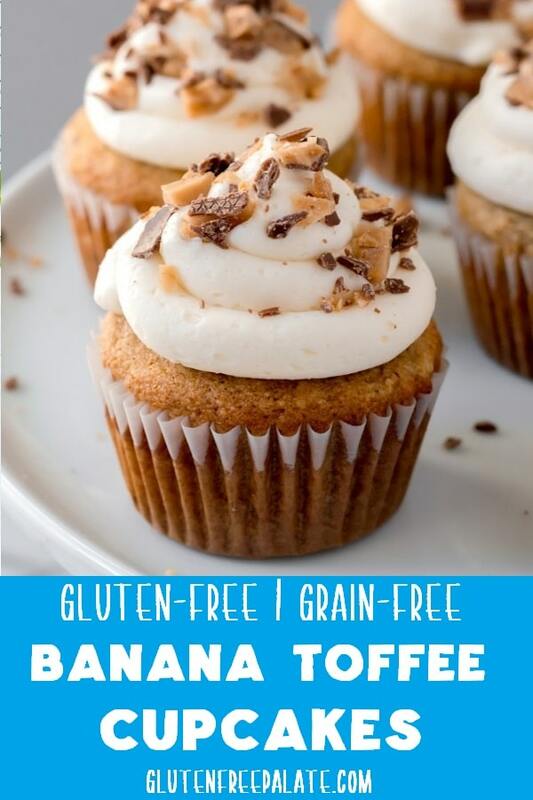 For those who are sticking to a refined sugar free diet, these grain-free banana toffee cupcakes are refined sugar free. It’s the frosting that’s not. 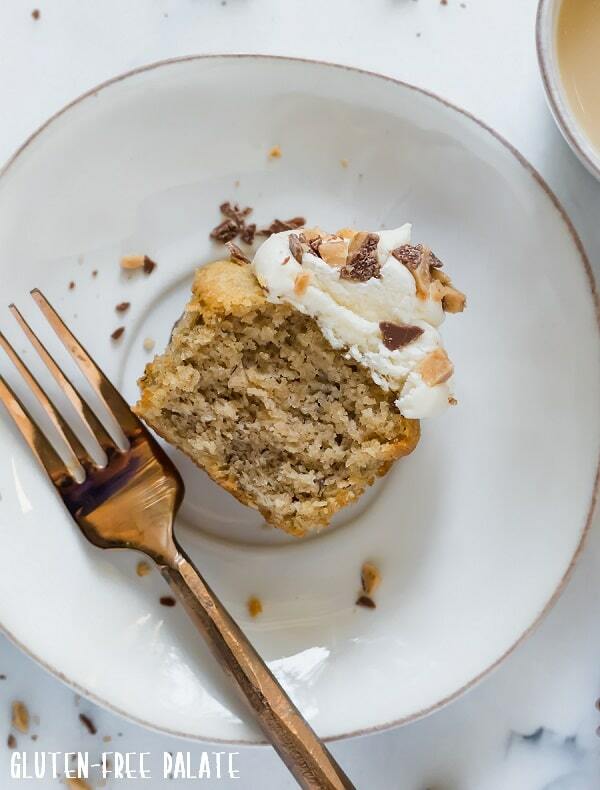 Simply make your favorite sugar-free frosting or leave the frosting and toffee off altogether to keep this grain-free banana toffee cupcake refined sugar free. Is powdered sugar grain free? Most powdered sugars contain a small percentage of cornstarch to prevent caking. Look for a brand that uses tapioca starch instead. We use Wholesome Sweet Powdered Sugar. It uses tapioca to prevent caking. I can’t have almond flour, what else can I use? This recipe was designed using almond flour. Some people have had great results using hazelnut flour. Please note that the flavor profiles are very different from each other. I haven’t tried hazelnut flour in this recipe but I have tried it in other recipes. What can I replace the banana with? I know not everyone likes bananas but the one banana in this recipe really helps the flavor and the texture. If you don’t like bananas you can make a grain-free vanilla cupcake by leaving the banana out and adding a third egg. 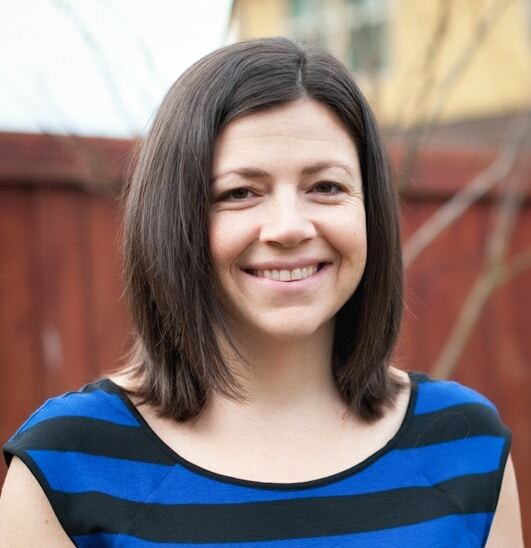 Almond flour has more natural oils in it then most other flour types, so keep that in mind. These grain-free banana toffee cupcakes bake up in about 20 minutes. Depending on how full you want them to be, this recipe makes 8-12 grain-free cupcakes. For the toffee, you can use your favorite gluten-free toffee. 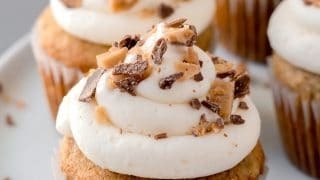 If you are leading a dairy-free lifestyle I recommend topping these cupcakes with Vegan Maple Cashew Cream Cheese Frosting from Cotter Crunch. 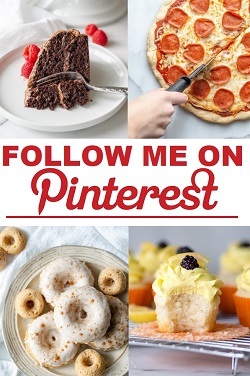 You might also like this Paleo Frosting from Healthy Seasonal Recipes. 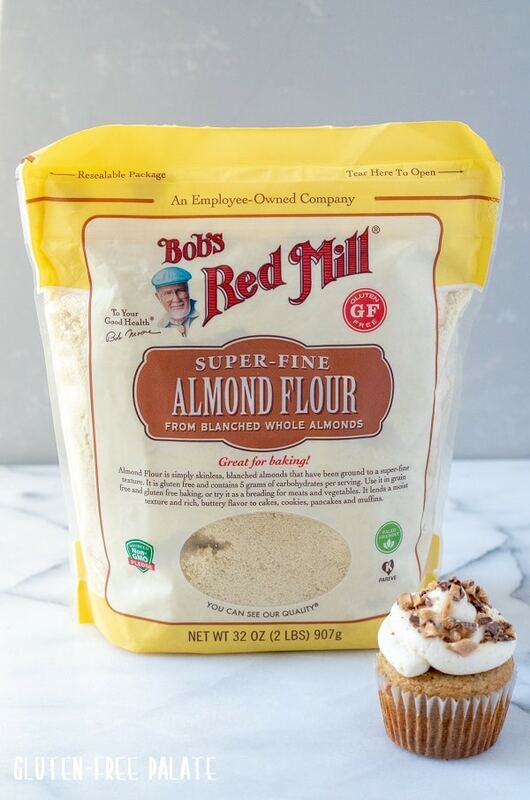 Looking for more grain-free recipes using Bob’s Red Mill Almond Flour? You’ll want to check out my Grain-Free Hummingbird Cake. 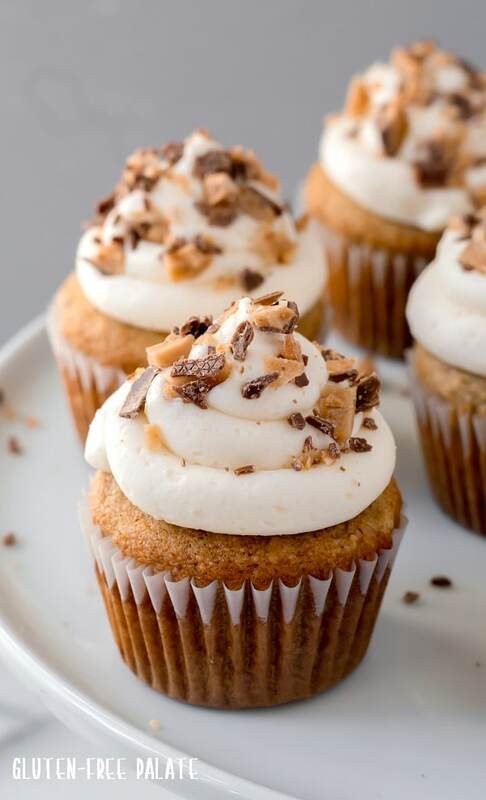 Sweet, tender, and bursting with bananas, these grain-free banana toffee cupcakes have the perfect combination of flavors. Preheat oven to 350°F (180°C). Line a cupcake pan with 8-12 paper liners (depending on how full you want them); set aside. For the cupcakes: In a large mixing bowl, whisk almond flour, salt, cinnamon, and baking soda. Add oil, maple syrup, eggs, mashed banana, and vanilla extract and mix until well combined. Spoon batter evenly into your paper liners, or for fuller cupcakes, divide between 8 paper liners. Bake for 18-22 minutes or until the center is set. For the frosting: In a medium mixing bowl, beat together butter and vanilla until smooth and creamy. Gradually add powdered sugar, one cup at a time, beating well. Alternate one cup of powdered sugar and 1 tablespoon of milk until all ingredients are blended. Beat in additional milk if needed to obtain desired constancy. Frost, top with crushed toffee pieces, and enjoy. i love banana and toffee together! These banana toffee cupcakes look so good! They look delicious! Any ideas as how to make these without eggs? I haven’t made these without eggs. Sorry!